Why Attend ISC West 2014? ISC West is the largest physical security show in North America featuring over 1,000 exhibitors in one place in just 3 days. ISC business education programs will keep you informed on the most relevant products, technologies, and strategies in today’s evolving security market. SIA Education@ISC West is your top industry resource for vendor agnostic security and network training. With over 75 sessions, the program provides critical information on the newest technologies in security. Best of all, ISC West sessions qualify for credit through ASIS, ALOA, NICET and more. Certificates of attendance will be distributed to all conferees after the show. Simply use this document to report your hours. Besides education you get to be one of the first to discover new technologies and product on the market. Product categories presented include Wireless Application, Access Control, Alarms & Monitoring, Biometrics, Fire Control, Networked Security Products, Public Security and Safety, Remote Monitoring, Systems Integration, Video Surveillance and others. And of course, ISC wouldn’t not be one of the biggest industry expos without invaluable networking events. 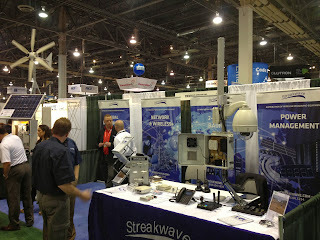 Streakwave Wireless, Inc. is an exhibitor at this event. Come see us at booth #18134. Grandstream Networks Training: Salt Lake City October 23rd, 2013 - Space is Limited! Hands-on Grandstream Training brought to you by Streakwave Wireless, Inc. and taught by Grandstream Staff with decades of experience in VoIP and IP Surveillance. Get direct access to Grandstream’s top technical personnel as they walk you through step by step programming of their new UCM6100 series of PBX units, IP phones and IP cameras, as well as introducing you to their entire VoIP and IP Surveillance product lines. 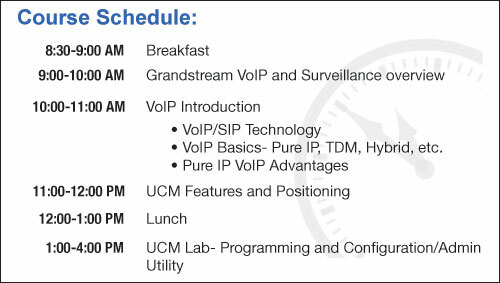 Course materials (including VoIP advantages) are combined with a 3 hour lab working on programming the equipment so you leave with confidence and a good working knowledge of the UCM PBX. Every student will have the opportunity to use Grandstream’s UCM PBX, VoIP handsets and IP Cameras. 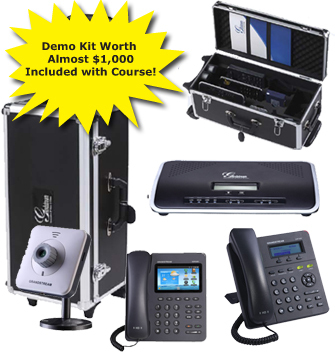 VoIP product brochures, surveillance product brochures and all of this is contained in a durable Grandstream-branded hard sided rolling carrying case. We break down education and training information by the technical level of each subject. If you are new to the industry, would like a refresher, or just want to learn new principles in RF and wireless technology, look at Level 1 topics. If you are more advanced and understand foundational principles, but want to learn new materials or be refreshed on the topic, then you will find Level 2 topics more in line with your background. Your instructors are knowledgeable Streakwave Wireless trainers and industry professionals who have years of experience and can relate to the situations and issues you encounter when architecting and implementing your network and wireless deployments. Click on the video thumbnail below to enjoy "Tower Perspective," an amazing, one-of-a-kind look into the basic safety preparations and equipment it takes to climb an eighty to ninety foot wireless tower. Experience the unique perspective of Ether Web Network field technician Jon Swartz, a California-based Wireless Internet Service Provider (WISP), as he installs an Ubiquiti sector antenna at the top of a windmill structure. Be sure to check for periodic additions of new video content. We hope that you enjoy the Streakwave Wireless Learning Center! Streakwave Webinars is pleased to present FleetLynx from Vecima Networks. Wireless is adding a new dimension - fleet tracking, maintenance, control and efficiency monitoring at low cost and high return. You likely haven't seen a product like this before. FleetLynx is more than a GPS or tracking product, it provides effective information for maintenance, efficiency, compliance, and cost-savings. In a simple plug-and-play deployment, you can track, monitor, and evaluate literally hundreds of key elements of transportation and mobile fleet attributes. It can be for one vehicle or hundreds -- in one location or dozens. What Features? See up-to-the-moment and elapsed fuel economy, track idle periods and occurrences, locationally track vehicles (multiple ways) and create geofencing with custom alerts, gain real-time SAE J1939 or OBD-II vehicle diagnostic information (engine, fluids, transmission, EPA, mileage and other data) and standards with many different maintenance, communications, and faults point reporting. Why FleetLynx? Simply put, this new product line lets you know just about everything you would want to know about the status and efficiency of your deployed vehicles (large and small) at a very low cost. In short order you can determine ways to lower your transportation operating costs and improve safety and efficiency. Fully integrated with Google™ Maps this new tool is wireless and easily accessible. You can even control your data from your smart phone or tablet from an easy-to-use dashboard application. Your data is securely stored and available through an open API for integration with your existing back office software. Data history is available for audit and live analysis from the moment the unit is installed. Where is FleetLynx Used? FleetLynx is a powerful product line for any type of mobile deployed fleet be they long-haul vehicles & trucks, service deployed vehicles and bucket-trucks, field delivery vehicles, emergency vehicles (police, fire, utility, EMS, and more) or private vehicles. FleetLynx is a solution for almost all classes of utility and deployed vehicles. Join Streakwave for this free webinar. Register today! Streakwave Webinars is pleased to present Cambium Networks - PMP450. A public and free Webinar. Presented by Product Manager, Matt Mangriotis of Cambium Networks and Richard Bernhardt, Sr. Marketing Director of Streakwave Wireless, learn about: product performance and attributes; solutions/applications; deployment options; compatibilities; accessories and more for the new advanced PMP450 product. Cambium Networks technology has a rich legacy. It has been used extensively. Now the PMP450 provides access to new functionality and excellent performance. The Webinar will include a presentation from Cambium and a digital Q&A. 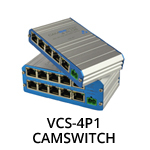 According to Cambium, the Canopy PMP 450 Access Point (AP) can provide more than 90 Mbps throughput and will be interoperable with Canopy 430 series and 100 Series Subscriber Modules (SM) via a separately purchased downloadable license key. Please join Cambium and Streakwave as we explore the PMP450. ISTE’s annual conference and exposition is hosted by the International Society for Technology in Education (ISTE), in cooperation with our regional affiliate partner. This year’s affiliate partner is TCEA. ISTE is the premier membership association for educators and education leaders engaged in advancing excellence in learning and teaching through innovative and effective uses of technology. ISTE members include individuals, regional and international affiliate organizations, and corporations. With its affiliate network, ISTE represents more than 100,000 education leaders throughout the world. ISTE is also home to the NETS standards for learning, teaching, and leading in the digital age. The NETS are widely recognized and adopted worldwide. We hope you’ll join us for ISTE 2013, ISTE’s 34th annual conference and exposition. Find out more about how our conference has evolved over the years, by visiting the past conferences page. View the housing map and list of official ISTE 2013 hotels for information on distance, price, and amenities. Full amenity information can be found at the hotel's website. Shuttle service is provided, Sunday–Wednesday, to and from the convention center at select hotels. Use the online reservation system to view available rooms and book your housing reservations.